After taking a look at newly launched Podio.com, I declare 2011 the year of group collaboration. While group collaboration is not new and products like Yahoo Groups (yet another squandered opportunity) and Google Groups (what's taking these guys so long to realize the potential there) have existed for almost a decade now, the marketplace is ready for the 2nd wave of the group collaboration that is going to draw on many other advances that have been made in the internet technologies world. Advances like Activity Streams, App Stores, clean and dynamic designs, etc.. There are many startups and incumbents vying for this lucrative market - Salesforce, Jive, and Yammer are the ones that come to mind. I'm going to rule out Salesforce due to the amount of other weight they have to carry around - they are not going to be the first ones to get this right..(I'm also obviously ruling out Microsoft and Google for similar reasons - they've got too much legacy and too many other projects clamoring for attention to be able to come up with a dominant design for group collaboration). Yammer has something big in the hopper having raised $25M a few months ago however! Podio is a brand new player that's coming out onto the marketplace swinging for the fences. I've briefly reviewed the product and it seems very solid and very formidable. You've got all your basics - work is organized into workspaces, each workspace has got an activity stream, a task list, and a calendar. This is far from IT however.. 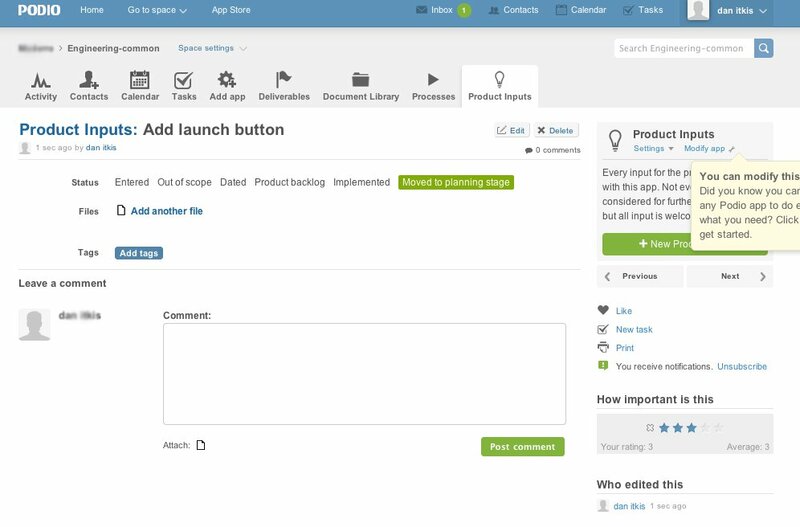 The user then starts adding Marketplace apps to the workspace, which there are plenty of - deliverables, documents, designs, product input, processes, presentations - the list goes on and on.. In addition to read-made modules, Podiohas an app builder out of the gate. Podio is not naive to think that they can get a market overnight by doing a slightly better job at implementation and packaging of the features. No sir! They are making a very gutsy move by opening a retail (yes, you heard me right, retail! presence right on their opening day). Not even Salesforce had the foresight (I'm assuming money is not the problem here) to do this. I'm really curious to see how this is going to go down and look forward to using the product! The address is 224 6th Street San Francisco, CA 94103. Various firms have made good collaborations to develop new tools. These web 2.0 products make our online lives easier.